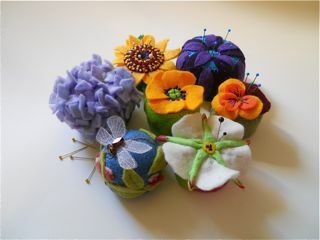 My seven small pincushion group was entered in the California State Fair in the "Other creative arts" category. It won an honorable mention with comments that it was wonderful but needed a display made for it. It was fun to enter them. However, someone must have liked the hydranga pincushion, because it disappeared and I did not get it returned. I guess I will have to make another!